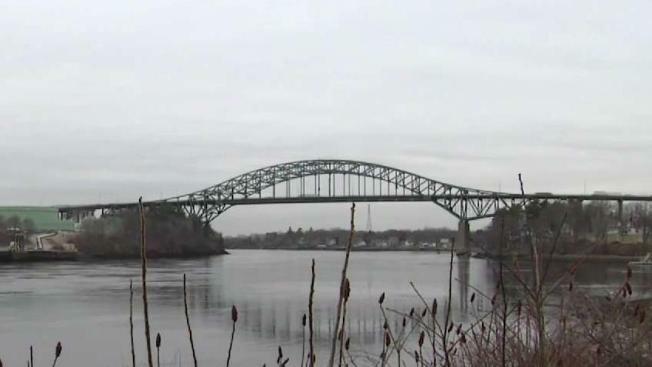 Over the next three years, the Maine and New Hampshire departments of transportation will be repaving and repairing the Piscataqua River Bridge which connects the two New England states. A major Maine artery is getting a rehab. Over the next three years, the Maine and New Hampshire Departments of Transportation will be repaving and performing maintenance on the Piscataqua River Bridge. The maintenance is part of a $53 million project that’s the first of its kind performed on the bridge since it opened in 1972. Beginning in June, the bridge which carries Interstate 95 between Maine and Portsmouth, New Hampshire, will be at the center of a work zone with a number of lane closures, ramp closures and reduced speed limits. Maine’s Department of Transporation spokesman, Paul Merrill, says the traffic pattern will adjust with volume and three bridge lanes will be open in both directions during peak times. People living in the town of Kittery are a little leary of having another bridge rebuilt in their backyard. Over the past few years, the town’s streets have been flooded with cars rerouted by the construction of the new Sarah Mildred Long bridge. Locals also say many out-of-state drivers using Waze or other apps end up trying to use Kittery as a shortcut around highway traffic jams. Shannon Hill, co-owner of the Maine Meat butcher shop is hopeful the DOT’s plans to only close lanes at off-peak times will help mitigate that problem and avoid clogged roads. If all goes according to plan, the bridge rehab will be complete by 2022.